(c) 1986 by Kathleen Kemsley. 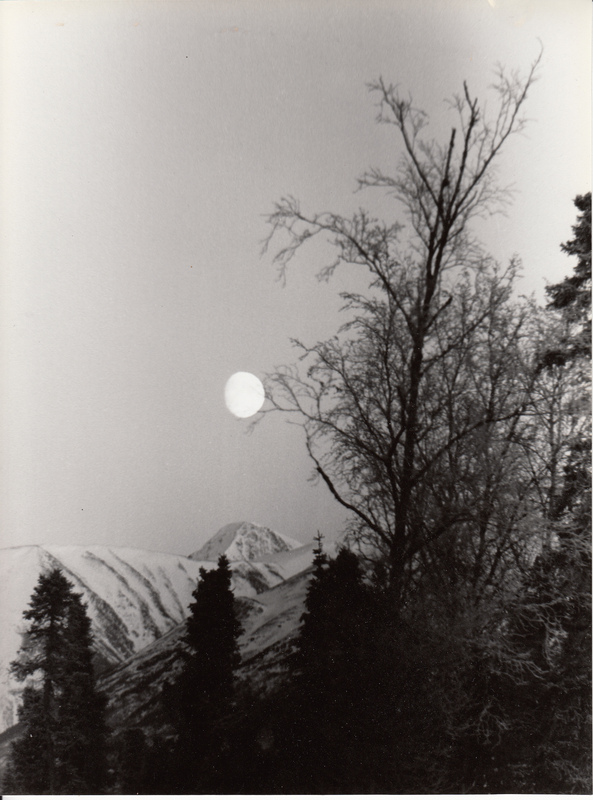 Originally published in We Alaskans Magazine, March 1986. Glaciers consume the parking lots and ooze across the highway. The entire upper Kenai River Valley has been glazed with gray ice and overflow for two months. I wish for the lake to freeze, but what ice the lake’s surface forms inevitably ends up piled like driftwood on its shores, the victim of Chinook winds and rain. I wax my skis longingly, but meager snowfalls liquefy and then congeal into glaciers before my eyes. I moved here from the Interior of Alaska while the aspens still glowed like fire on the steep slopes of the Kenai Mountains and the sun threw laser rays off turquoise riffles of the river. Since mid-October the weak glimmer of winter sun has not reached this town. Nestled in a pocket of river valley and dense spruce trees, Cooper Landing surrenders the sun to the Harding Icefield. But this year, the traditional icy grip of Alaska winter has been dissipated by warm rain. Day after day I stare at the gray skies and glaciers and question the redeeming value of this so-called Banana Belt paradise. One day I look up to see the silhouette of soaring black wings against the leaden sky. An eagle! I follow it down to the river and discover a community of hundreds. The rain and open water and warmish winds provide a perfect haven for them. The absence of sunlight does not seem to deter them from reveling in the riparian domain. 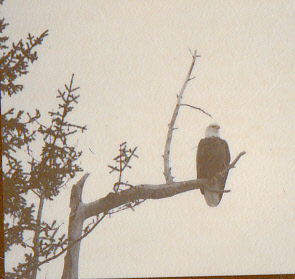 I become an eagle watcher along the river. Clusters of them crouch like old cronies on an ice-glazed rocky bank, tearing into dead salmon with gusto and enthusiasm. A juvenile bird, already sporting a four-foot wingspan but clad in the mottled brown feathers of youth, slides past me on an invisible gust of humid air and banks out across the rapids without apparent effort. Another afternoon a young eagle swishes past my shoulder with a bit of salmon carrion clenched in its talons. An adult with sunburst-yellow beak gaping hungrily dives and pursues the youngster, but fails in its efforts to make the kid to surrender its morsel. Between these rounds of activity, the eagles seem merely to be biding their time on the river. They perch in groups of three or four for hours at a time, staggered on the limbs of the biggest, deadest trees along the opposite shore. And they wait patiently. They have been wintering here long enough to notice when the daylight begins to lengthen. Into their collective memory is instilled the assurance of spring salmon runs, green buds bursting forth from mazes of willow branches, and fierce competition from black bears and anglers for dinner. In this valley of perennial rain and warm air currents that slide down rocky mountain slopes, the eagles let the time pass. And I have begun to let the time pass in their company. In the hours I have spent spying on them across the open water, I have never heard them complain about the weather or the glaciers. They accept what is. Their conversations contain no snowfall record comparisons, no discussions of the merits of wearing golf shoes for parking lot travel. Each winter is unique, with character determined independently of last season’s conditions. The only certainties are that the time will pass and that the seasons will change. So the eagles teach me. Tossing into the swift river my fickle thermometer, I too commence to let the open water flow. I possess neither the power nor the will to halt it.